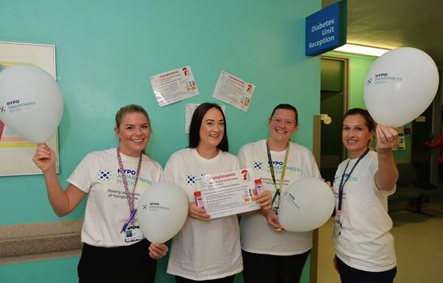 The specialist team wore their t-shirts throughout the week, allowing staff and members of the public to freely approach them to discuss hypos and ask questions. The NUH recently switched the chosen liquid hypo treatment, and in view of needing to re-educate the Trust, plus taking into account the audit results, they launched Hypo Awareness Week. They developed an easy to read, quick-guide poster on hypoglycaemia including treatments and situations which was sent trust-wide. The team said they understand hospital pressures and natural panic responses to a hypo, especially when diabetes is not the ward specialty. However, they recognised how important it was that people with diabetes admitted to hospital, must always receive excellent, appropriate, safe care. Therefore, they wanted to spread the word, ensuring staff appropriately treat hypos efficiently and comfortably.